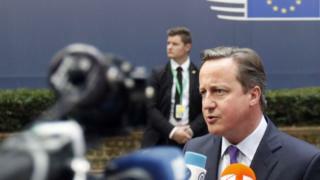 David Cameron says he will set out his EU reform demands within weeks and pledged to "quicken the pace" of talks. His proposals will be published in a letter to European Council president Donald Tusk in early November. Earlier EU Parliament president Martin Schulz called for "clarity" while German Chancellor Angela Merkel said Britain needed to "clarify the substance" of what it wanted. Mr Cameron wants to reform the EU ahead of the UK's in-out referendum. Arriving for his talks with Mr Schulz, the PM, who also met European Commission president Jean-Claude Juncker over lunch, said the British renegotiation was "going well" and pointed to the progress of the UK legislation paving the way for the referendum. "The pace will now quicken, and I'll be again setting out the four vital areas where we need change, laying down what those changes will be at the start of November," he said. "So we quicken the pace and quicken those negotiations in the run-up to the December Council." The December meeting of the European Council will be a chance for Mr Cameron's demands to be considered by his EU counterparts. On Twitter, Mr Tusk welcomed Mr Cameron's plan to write to him with the UK's demands in early November, saying: "Then real negotiations can start". Downing Street confirmed the letter would be made public when it is sent in early November. In the meantime, talks have been taking place between UK and EU negotiating teams, but Mr Juncker said on Wednesday that "huge progress" was not being made and reminded the UK that "it takes two to tango". BBC Europe correspondent Chris Morris said those involved in the "technical talks" accepted they had "got as far as they can" and that the negotiations needed to "move onto the political level". The referendum has been promised by the end of 2017, but could be held sooner. Mr Cameron has not yet set out his demands in detail, but is thought to want exemption from an "ever-closer union", safeguards for non-eurozone countries and curbs on migrants' welfare entitlement. Speaking at a press briefing with Mr Juncker shortly before Mr Cameron's arrival, Mr Schulz said: "Both of us have made it quite clear that both the Commission and the European Parliament at all stages are willing to engage in constructive co-operation." He said he hoped for "steps forward", adding: "Above all, we need clarity on what we are going to be discussing over the next few months." Ms Merkel said it was up to the UK to "clarify the substance of what it is envisaging" in the coming weeks. She said Germany would work constructively with the British government. She added: "But it also goes without saying that there are things that are non-negotiable. "That there are achievements of European integration that cannot be haggled over, for example the principle of free movement and the principle of non-discrimination."